This year we have leveraged our partnership with the award winning, Belgium based Bioracer to create a range of limited edition stolen goat designs that sit on top of our incredibly popular Bodyline jersey. This means you get a super high tech jersey that fits just-so and is chock full of features. We use that as the ultimate blank canvas onto which we can paint one of a kind designs that inspire your next adventure. 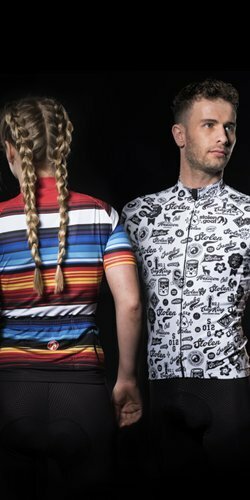 With a massive range of design options for you to choose from our limited edition cycling jerseys for men are bound to strike a chord with you. We have modern as well as retro-themed style options. Select your limited edition cycling jersey here. Combine them with our bib shorts for flat out performance and day long comfort. Add some socks or gloves for that final touch. The limited edition jerseys also combine very well with our core gilets. 2018 sees a massive shift in design for the womens jerseys, bolder, more colour and intricate design details makes for a stunning collection of limited edition collector pieces. A range of carefully crafted, on trend design options in the cycling jerseys, to be paired with our female specific shorts, and our unisex core gilets for some extra warmth on cooler rides. Add in a pair or two of our Italian made coolmax socks or cycling gloves for that final cherry on the cake in terms of style, fit and function.